AFDA Durban (The Theatre, Film and Television School, based in Glenn Anil) in collaboration with Wushwini Arts and Heritage centre together with the Inanda Heritage Route, created a project to bring important heritage sites in Durban to life, presenting three short theatre plays on those specific sites on March 24. The Inanda Heritage Route takes in some of the most important, albeit little-known, historical sites of Durban. Winding its way through the Inanda Valley, it provides a snapshot of critical South African history as well as, perhaps surprisingly, India's past. Gandhi stayed on here and started his passive resistance movement in 1907. The trail starts in Phoenix Settlement, established in 1904 by Gandhi. Here you can see Gandhi's house. Next it moves on to the Ohlange Institute, Rev John Dube and Nokutela Dube's house - a national monument - and Dube’s grave. 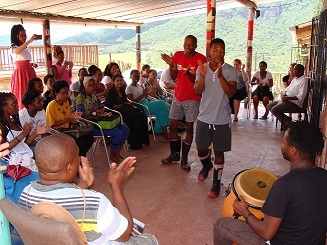 The Shembe community is also part of the Inanda heritage route ending at Wushwini Arts and Heritage Centre, overlooking the picturesque Inanda Dam. “AFDA Durban should play an active role in the KZN network for Theatre, Television and Film. Collaborations are prepared with KZN Music House, K-Cap in KwaMashu, Durban International Film Festival and different producers for television and Film. It is not only our responsibility to train the actors, directors, producers and crew on a level of excellence. We also must play an active role in creating job opportunities in KZN for our students,” said Roel Twijnstra: the Head of Live Performance of AFDA Durban; acclaimed theatre director and producer. Recently, AFDA Durban appointed a new Dean, Brent Quinn. Originally from Durban he is an award-winning film and television director and was the head of AFDA Jo’burg Film School. New Head of the Television school, Penny Flascas; Head of Film School Richard Green and Roel Twijnstra are working on an exciting and relevant curriculum, collaborations with other partners of the industry. The Inanda Heritage Route theatre project is the first result of those collaborative partnerships. Roel Twijnstra adds: “Imagine Ghandi and his family working in Phoenix Settlement, 800 meters away Dr. John Dube and his wife Nokhutela are working. They knew each other very well and met on a regular base. Ghandi’s philosophy influenced the founding vision of the ANC, Dube’s vision influence Ghandi’s philosophy. Add Shembe who lived physically in between the two and was a close friend. A recipe for cultural footprints that are still visible in South African society today. “Our first year actors students and first year television students have researched the history and created the three short plays. These plays are not history lessons but present some of the conflicts that these legendary characters were faced with,” said Twijnstra. The shows are free of charge and presented on March 24 at 12 noon in Phoenix Settlement; at 13h00 at Inanda’s Ohlange Institute and at 14h30 at Wushwini Arts and Heritage Centre. After this opening the Eager Artists Theatre Company based in Wushwini under direction of Jerry Pooe, will continue presenting the shows on the different sites on special days.